One has always said that there are the best and the rest in every field. Even in the field of search engines despite the presence of other players like Ask Jeeves, Bing, Baidu etc, Google is the undoubted leader. I am sure you all must be wondering as to how I forgot Yahoo. There was a time where Yahoo had become THE search engine which everyone logged onto. But today it’s not the case. The advent and subsequent crazy growth of Google has moved Yahoo into the second position. But events over the last one year and especially the new initiatives by Yahoo recently seem to have changed the perceptions of people associated with the industry. Can Yahoo fight back? Its moves give such an opinion. 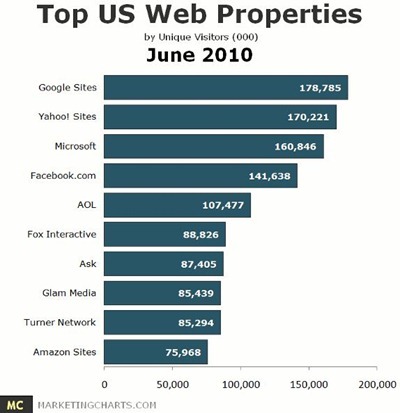 According to a comScore report in June 2010, Google sites were number one with 179 million unique visitors while Yahoo came a close second at 170 million visitors. 12% of the total time spent online is on Yahoo, while in India 1 out of every 3 people logs onto Yahoo. So a huge opportunity is there waiting to be tapped. Yahoo spent over US$ 100 million on a branding campaign last year. It was a move to improve its brand image because of increasing competition and a cluttered market. Yahoo’s next move is “Yahoo Pulse”. It is a service which will integrate all the social networking accounts of a person at one place itself without having to open different tabs. Moreover a person can not only chat but also play games, share files etc all under one roof. Another initiative which has been added to the website is the customer advocacy Group. It will help analyze the different users on the basis of demographics, the things they like or dislike and also what brings them back to the website. Yahoo has also started localizing its content after realizing that the top search keywords on it included entertainment, news and cricket. One of the greatest things Yahoo has done is that its search is now powered by Bing. This has led it to eat into the market share of Google. Even though that is not a big amount, after years of being at the forefront of search, Google is reaching somewhat of a saturation level. As of every strategy, this too has some good points and bad points. Only time will tell as to whether these innovations will bring Yahoo back to the numero uno position. But nonetheless it has made this market, one to watch out for? Do you think Yahoo can make a comeback? As I have always said, competition is amazing for the industry! Yeah i do feel Yahoo can make a come back. As far as i know yahoo was one of those first sites that launched the messenger and chat option. Google and Gmail came later on. No doubt google has done really well in th past few years and has reached th top but wit Yahoo coming up with Yahoo Pulse and other innovations it can surely become a good competitor with google. Really? When was this? I had never used yahoo search in the last decade. I remember there was a AltaVista search engine and Ask Jeeves in late 90s. But after that it was only Google. I think you confusing between logging into Yahoo portal and the yahoo search. The post is more from an Indian perspective. Yes, Altavista, Lycos, Infoseek and also AskJeeves were present. Though I don’t have any figures of that time, I hadn’t heard of many Indians using these other search options. Yes, the number of Indians who logged into Yahoo portal was much much higher than for the search engine, but when compared to other four, Yahoo search surely ranked much higher than the others. I don’t think so…! Google is unbeatable and they will come up with new ideas every time.